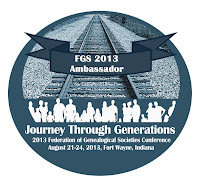 For today's Follow Friday post I would like to express appreciation to Randy Seaver and recommend his FGS 2013 Conference Blog Compendium post on his Genea-Musings blog. Randy has time to read more blogs than I do and he has created a useful compendium of blog posts about the Federation of Genealogical Societies (FGS) conference that has been going on in Fort Wayne, Indiana this week. I was unable to attend the conference and so I enjoy reading the blog posts of others who are attending. I was excited to hear about the news out of the FamilySearch bloggers dinner, as well as the announcement that the FGS conference will be in conjunction with the RootsTech conference in Salt Lake City in February of 2015, as I hope to be able to attend. I look forward to reading more posts about the FGS conference as it winds down, and Randy adds more posts to his list.